There has been no official news of a future NSX since then, but with Acura getting set to celebrate its 25th anniversary, who knows what surprises they might have in store. 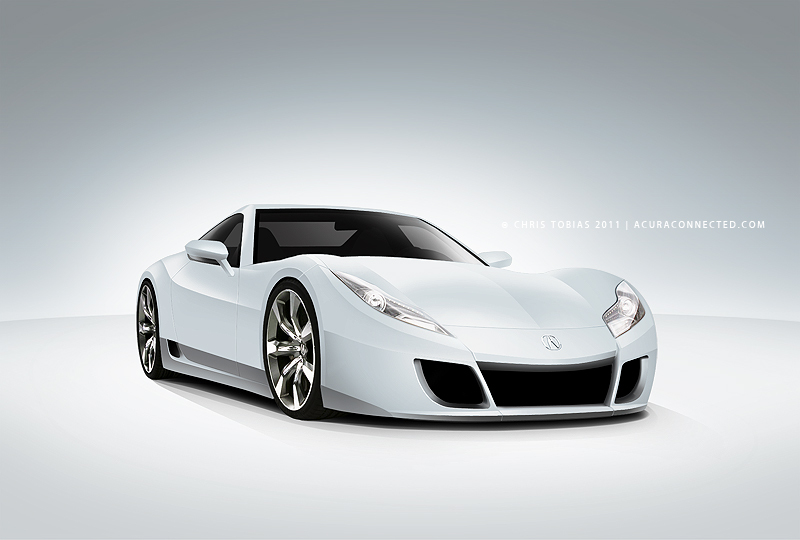 My NSX illustration was based mainly off the HSV-010 GT with a few cues from the 2007 Acura Advanced Sports Car Concept. For this rendering I actually used the wheels straight off the Acura concept. I considered a more aggressive front lip and side skirts but in the end decided to go with a sleek and simpler look. Click on the thumbnail for a larger version and let me know what you think by leaving a comment below. Lexus LFA… eat your heart out. This looks great. If they released a new halo car, would they call it the NSX though? The hood line is sloped too much. The reason for such an aggressive hood line on the HSV-010GT is to comply with SuperGT regulations. If you look at spy photos of the road going version you will notice the hood line is far more “normal” than on the race going version. Do you mean the camouflaged NSX prototype last seen on the Nurburgring in mid 2008? I see what you mean, though I think I actually like the sharper hood line of the HSV. Yes. If you look at any of the SuperGT cars you will find that the hood line is significantly lower/sharper than it’s production counterpart. By the way, great job on the render! I would love to see you do a render with the hood line similar to the camouflaged NSX prototype. I like japanese sports cars. whoever they build them.